We were impressed by the sheer size of this shed or workshop as well as its versatility. 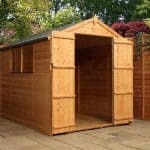 In effect, it’s two sheds in one, because at the rear of the interior is a separate storage facility which can also be accessed through its own personnel door. Whether in the main section, or the rear section, there’s lots of room to move around in thanks to the generous height of the apex roof and the eaves. 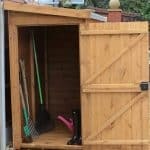 These factors make the shed suitable as a garden building, a workshop, or even a secure storage space. 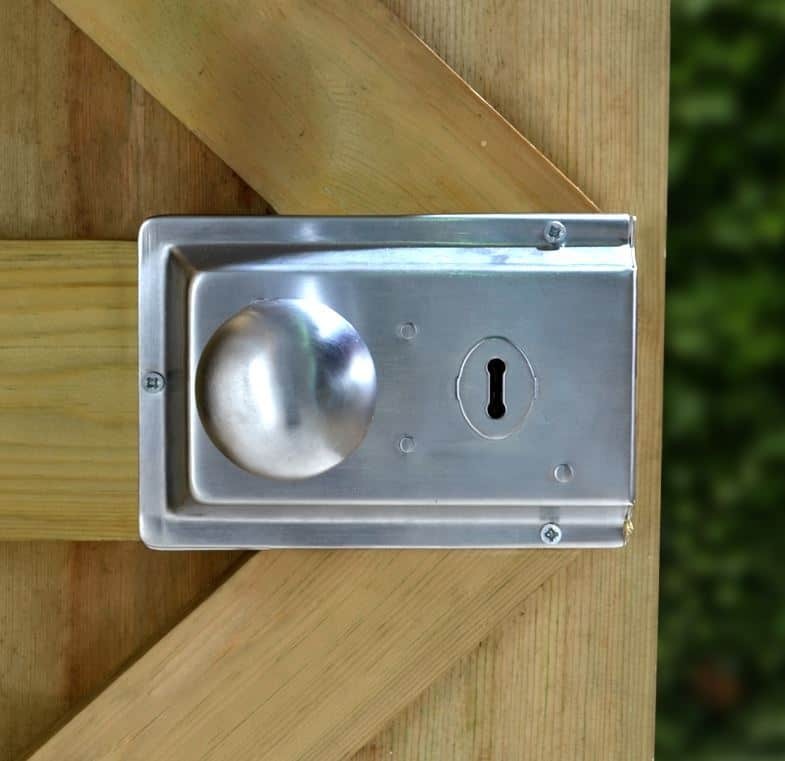 That’s helped by the inclusion of a strong locking system that is operated through the use of a key much the same as you’d find in a house door. It’s tough and resilient, and just the sight of it may be enough to make opportune thieves pass by and turn their attention elsewhere. The apex nature of the roof helps to stop water getting into the shed itself, of course, and this is also helped the interlocking cladding used on the walls which are covered by a 15 year guarantee. We found it relatively easy, if a little time consuming, to put together, but if you prefer you can take advantage of the installation service and let the professionals do it for you. 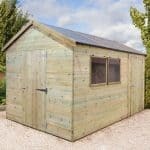 The Champion range from Shed-Plus features a variety of high quality premium sheds, but this is the largest in the range. It’s huge, and when inside it felt even roomier than it actually is thanks to the shallow apex based upon tall eaves. That not only means that there was lots of room to move about in, it also means that it’s easy to move tall equipment or machinery in and out which is just one reason why it’s so suitable for use as a workshop for a hobby or even a small business. The roof itself is great at keeping rain out of the building as it’s constructed from tongue and groove cladding and topped by tough mineral felt. The ridge height is 2.31m, and the eaves height is 1.73m. 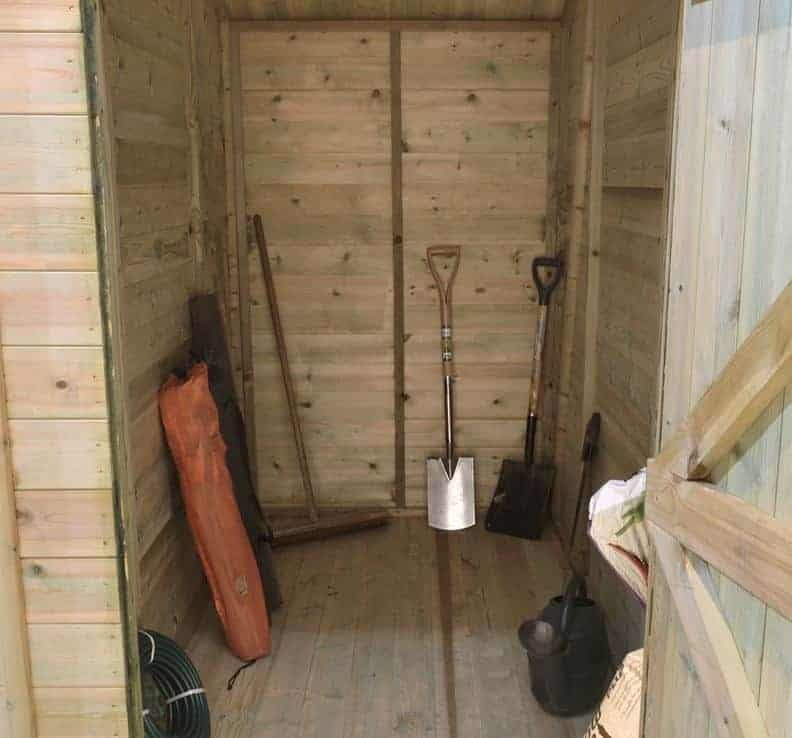 It’s this combination which helps to make the shed seem so spacious. At its base the shed has a total width of 2.44m and a depth of 4.85m. The two single doors are each 1.80m high and 0.89m wide, which is easily enough to move most garden objects in and out. We were pleased that the manufacturer had used such thick cladding as otherwise a shed of these dimensions could feel flimsy and insecure. With a depth of 12mm the tongue and groove cladding used on this shed felt very strong and should withstand fierce storms. The framing size of 34mm X 34mm helps to add to the overall stability of the structure. The same tongue and groove cladding is used for the walls, roof and floor. This not only creates a pleasing and uniformly smooth look, it also ensures that there are no gaps that rain could penetrate into. The floor joists, like the other timbers, are pressure treated to stop the threat of rising water as well. 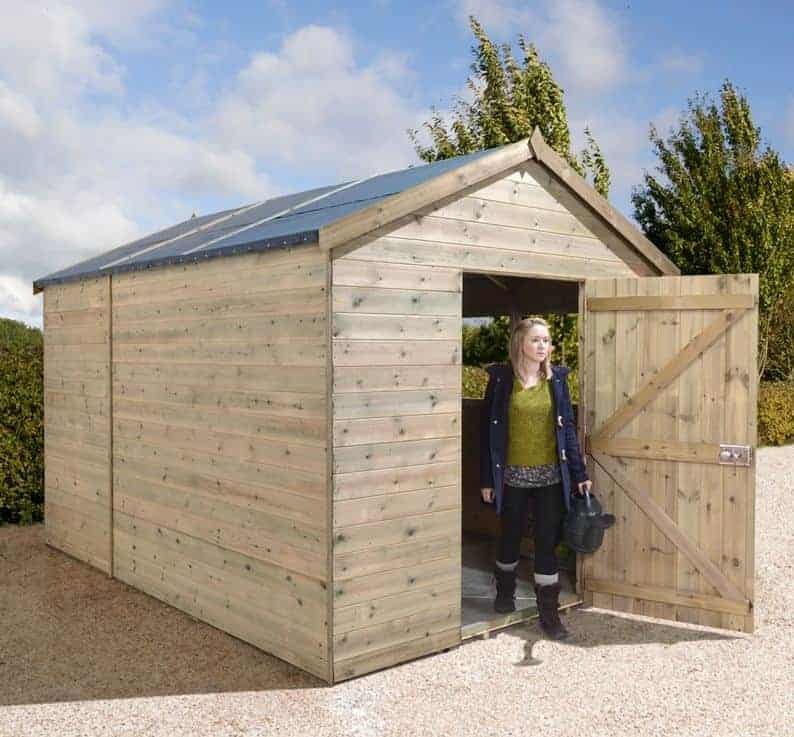 When we review sheds with dimensions as large as this, we are always keen to see what the re-treatment requirements are, as a lot of preservative would be needed to cover the surface. That’s why we were so pleased to see that no annual retreatment is specified by the manufacturer in order to keep the warranty valid. The use of high quality preservative during the initial pressure treatment has allowed Shed-Plus to provide a 15 year guarantee against rot. 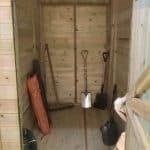 As weather conditions can be variable, however, we would still recommend inspecting this shed every year and being prepared to add extra preservative if needed. We found the doors to be solid to the touch, and the strong hinges were reassuring too. There are two single doors, one at the front, and one at the side rear which gives access to the additional storage area. The height and width of both doors was generous, and befitting a shed of this size. There are two windows that are situated on a side panel adjacent to each other. We found that they offered an excellent level of natural light, and they can both be opened to regulate temperature on hot days. These both feature tough safety glass. The rear storage area is window free, ensuring that unwanted eyes can’t see what is kept within. We prefer a lock and key system, as featured here, to pad bolts on sheds of this size, as they are more resilient and harder to bypass. 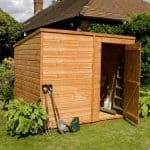 In effect it means that the shed is as difficult to access for a thief as the front door to your house. 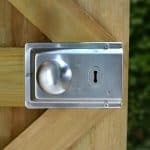 If an alarm system or CCTV camera is also added this would make it an excellent secure storage unit. If you like the idea of having a large workshop or storage space but are worried about the time and effort that would be involved in constructing it, then the professional installation service is a perfect optional extra. While we managed to put it together with two people, the sheer size of the structure means that two or three days should be set aside for the purpose. A 16’ X 8’ slatted roof is another optional extra, although this does add £499 to the purchase price. It creates a pleasing rustic appearance while retaining the excellent weather proofing qualities found on the standard tongue and groove roof supplied. 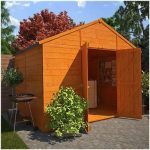 With a shed of this size we would expect a high quality finish, but even so were impressed with the quality of materials used and the overall aesthetic appeal. Because this shed is so large it will be exposed to a lot of rain over the course of a year. 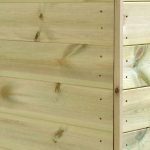 The excellent and thick tongue and groove cladding, however, is more than enough to combat this threat, as shown by the 15 year guarantee against rot provided by the manufacturer. 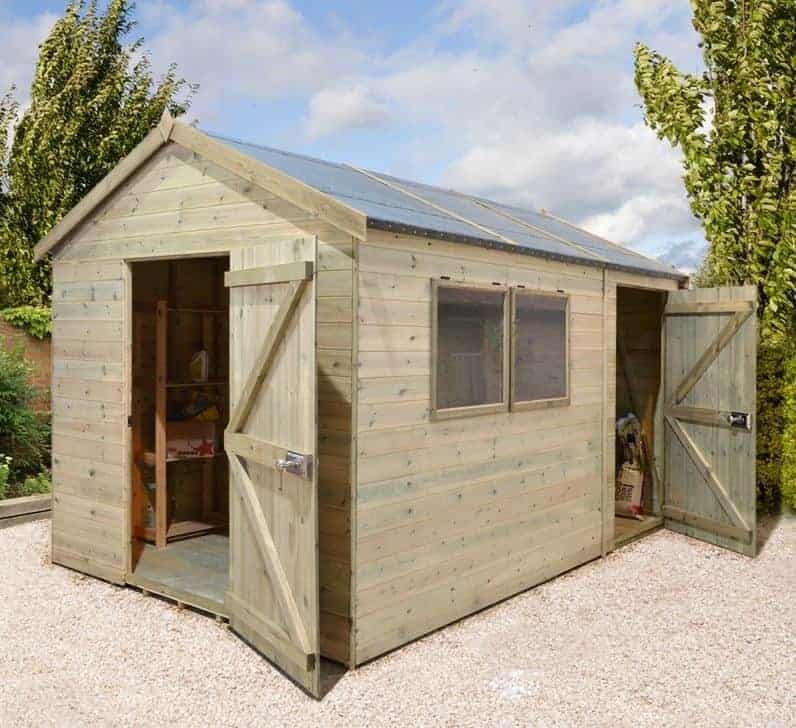 As the largest shed in this manufacturer’s range, there’s more than enough room for most people, even if it’s being used as a workshop. 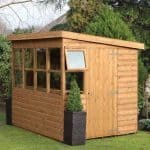 As a combination shed, it also comes with an additional storage space at the back which being windowless is extremely secure. Although we found the instructions comprehensive yet straight forward, and all the fixtures and fittings are included, it still took two days to fully install. The optional installation service, therefore, is well worth considering. 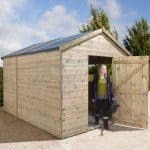 This shed is at the top end of this manufacturer’s price range, yet value for money is still provided when we consider the huge storage capacity and the excellent weatherproofing and security features that come as standard. Final Thoughts: For such a large shed, we found it well constructed, durable, and good looking. We would have preferred it to come pre-stained or painted, as this would save the owner time and money, but this is counteracted by the fact that no annual preservative treatment is required in order to keep the 15 year warranty valid. 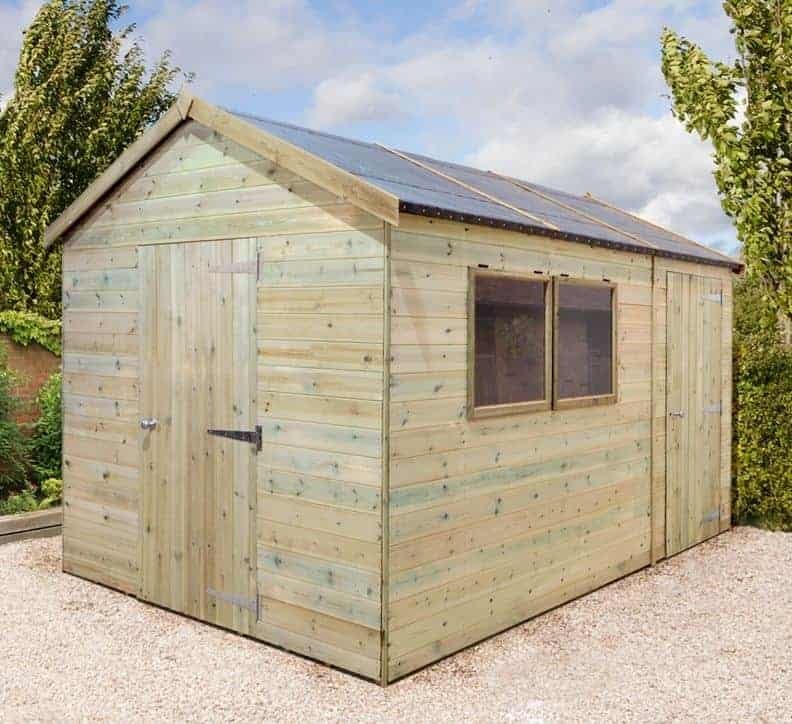 The combination aspect of this shed means that valuable equipment can be securely stored in the rear portion, where there are no windows to allow others to see inside, and the key and lock system and strong glazing also help to keep the shed as a whole secure. For this reason, we recommend this shed as either a spacious workshop or a storage facility, particularly if additional security features such as alarms are added.